I recently had some long-delayed repairs done to my beloved Teac Reel-to-Reel machine, and as a result, I'm now ready to begin a project that I've wished to pursue for some time. In my basement, there sit hundreds of reel to reel tapes. Most of them are there because of my close to 25 years of seeking out odd, wonderful, obscure or unexplainable recordings on reels. Whenever I've had the chance to buy old reels - either marked in some intriguing way or simply very old and unlabeled in any way - I've usually taken that chance. Sure, many of them turn out to contain nothing more than someone's classical collection, Herb Alpert records or simply blank, but a good percentage have something at least fairly interesting, and some of them are just amazing. This last category has included dozens of audio letters, lots of advertising samplers, all sorts of family recordingsm as well as rare media recordings (radio and TV from the '50's and early '60's), to name just a few categories. There's even a whole batch of tapes from someone who apparently ran a nudist colony in the 1960's, containing his various radio appearances and other related recordings, promoting his business and explaining the concept. Collecting tapes is also how I was first introduced to Merigail Moreland, as well as the Star Ads, both of which I've shared here multiple times in the past. Today, the contents of two of those tapes. These tapes are representative of the collection, although I don't claim them to be the best or most interesting. They are simply the first ones I grabbed from an at-best moderately un-arranged collection. I will continue to digitize tapes from this collection as one part of my series of posts. The first tape, as seen in the back of the box, above, contains outtakes from a recording session for what I'm guessing was a slide show or a filmstrip presentation regarding the 1959 products from the Homko company, makers of lawn mowers and related products. Ads for 1959 Homko products can be seen here, and here. This would appear to be from the tail end of a recording session, and I just love the guy's peppy voice, and some of the things that he says upon blowing a take. Following the Homko ad is a short segment of an advertising segment for something called Marhofer Meats. The other of today's reels contains 12 advertisements for five businesses and six additional public service anti-drug ads. Based on the businesses involved, it appears that these were all produced in and/or for the Pacific Northwest and Alaskan markets. I'm not actually sure that the second batch is for a phone company - no company is named - but this seems the most likely customer. My favorite is the Grizzly Burger ad, particularly a line about Chicago, and the anti-drug ads. Anyone else think that might be Ken Nordine on the last one? And speaking of the last one, what is the person in the background humming? It sounds to me like the tune to "I want a girl, just like the girl who married dear old dad", but that can't be right, can it? I'd bet my life that that's Ken on that last one. haha! wow! I usually buy this kind of things at the salvation army. I like the anti-drugs ads. I will be curious to hear what is presented as you go deeper into the archives of the tapes. I have a couple boxes of reels as well and need to find the time to get my TEAC functional again to digitize...what program did you use for transferring the tapes? I am running on Mac OS 10.4.....keep up the good work. Arthur- please do the world a favor and post that reel! I use it with manual levels as the automatic setting lowers the level too much when it encounters a sudden loud sound. The best reason to use it is the feature it has to save the recording into tracks. You set the markers (though it can be done automatically too). It's a little crude but fairly stable. Has crashed here and there and once in awhile you might need to re-record or re-edit due to strange errors. Thanks for the comments! Arthur, I would also LOVE to hear that tape. Wow. 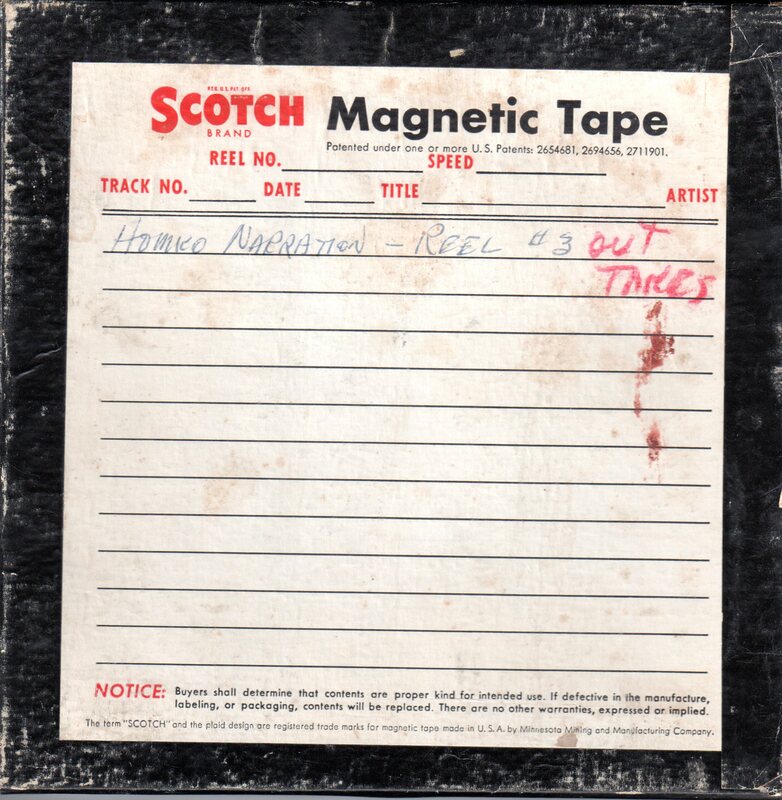 I'm certain these are recordings for commercials (Marhoefer) and industrial films (Homko) produced by Academy Film Productions in Chicago in the late 50s. The company's films are now in the vaults of WPA Film Library, a stock-footage outfit. The database doesn't allow links, but do a search on "Homko" and "Marhoefer" (note the extra 'e'). The Marhoefer commercial is definitely there. So where did you find these tapes? The "unidentified Asian music" is the iconic Japanese folk song "Sakura Sakura." It is being sung by a young person who is not a native speaker of standard Japanese but who is doing a fairly good stab at the tune. Check out my friend's retro-electronica video of "Sakura Sakura" on the Theremin in full drag kimono. Thanks to Jeff and Taro for providing further information about what I posted. Taro, that theremin clip is absolutely amazing. Jeff, thanks for the link to the WPA site. Unfortunately, when I search for both of those items, I get to pages where I'm told that the films are not available to view at this time. Are you having better luck? I'm sure that I bought this tape (and some others featuring the same voice, for Bouchell Carpets, and maybe other products), at the Mammoth Music Mart, a yearly used music sale which ran for some 25 years, before ending several years ago. Hi sort of stumbled on this blog site on Sunday evening; so much to take in I think I'll have a good look around so I won't sound too much like a dork... If that's the right word these days.